Starting off, this was real hard for me to do. For many years, I've owned Leica lenses and never a body. That decision has been because I'm an admirer of the lenses, but always felt the bodies, and maybe even the culture behind owning a Leica more status than practical. It was also difficult for me to come to terms that my own personal feelings of Digital vs Film wasn't so much about dispelling any misconceptions of one over the other, but more about what this system meant to me. I've been involved with imaging for over 25 years and I'm no stranger to film. I'm also no stranger to pulling the very best out of both film and digital files. The notion that there is a 'look' is such a subjective point of view. Over the years, I've created film and digital manipulations that could come from either, but this isn't a debate about those merits. I say this to establish that my journey in photography has always been a balance between the two. Now this isn't going to be another blog entry where a photographer is self-professing a return to film, or to say that a light has been seen to move to a Leica system. Part of this is about practicality for me. I had recently picked up a rangefinder Weltur Welta that shoots 120 film and 75+ years old. The experience in using this system was something very liberating. To be clear though, this was not an experience that had no issues. The Weltur requires hand winding with a view port on the back. Cocking shutters, taking meter readings, adjusting aperture and shutter speeds, and then using the rangefinder to verify focus. If anything, it would be frustrating. But I did say practicality earlier, and what this gives me was a couple of things. The 120 format in a small compact foldable system, with a bloody fast triplet lens with very nice background blur, and something that I could fit into a pocket. The image quality rivals my Hasselblad film cameras, and this is no where near the same weight. The rangefinder is also something of a treat for my aging vision, and last but not least, a 6x6 square format that I adore. 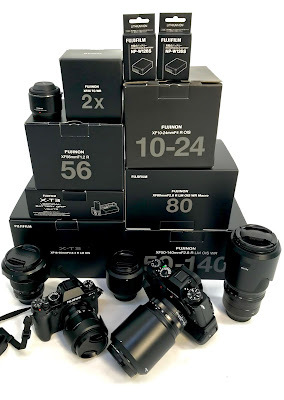 This got me thinking about other cameras again. But this still didn't drive me to the Leica. What happened next was a bit of an oddity, maybe even something of a realization. One of the reasons why I love Leica lenses is partially to do with how it is designed to focus easily without even looking through a viewfinder. Two things on Leica lenses that make this easy for many users. First the focus helicoid can generally be turned with a half turn and cover the entire range from near to far. The second is that this is done with an armature to make it easier. I had recently salvaged a lens and created a focusable helicoid system which I mounted to my EOS-M digital camera. The ironic realization was that this creation I had made emulated the focusing experience of a Leica lens. 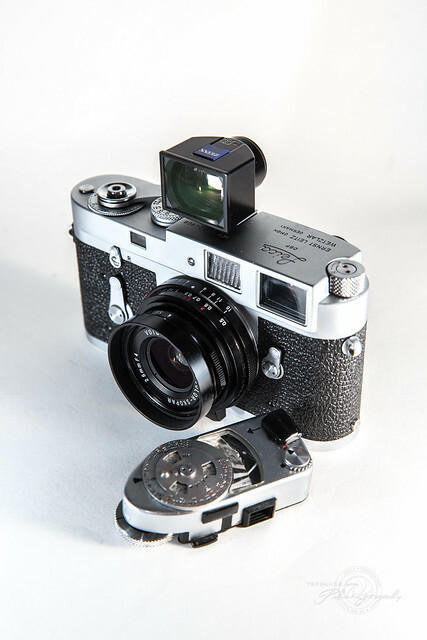 It gave me fantastic results that I couldn't help but be reminded of a full Leica experience. But again, this wasn't the final straw that sent me to the Leica. I recently came into a small collection of antique abandoned cameras. One of them was an old Ikon Contaflex SLR camera. The camera has a classic fresnel focusing system and a mirror that needs to be cocked between shots. What was real cool about this camera was the old selenium based meter that gave me the necessary readings while I used it. Focusing was a little awkward, and frankly, I felt the ergonomics of the beast was a little frustrating at times. However I really liked being patient with it. Taking the occasional reading, but even just framing, and waiting for a decisive moment was a joy. Even when I wanted to take a discrete or quick shot, I found it was real easy to do. Something I certainly know that Leica cameras are very well known for, and was reminded when using this camera in that way. But that was still not what drove me to getting a Leica body. Many of my associates have often said that I have an obsession with detail. This would certainly be true. But another thing that relates to this is what I've done all my life. Found more detail behind the details. My entire career I've been obsessed with all levels of details. Details in quality, details in information, details to master on my own, or details in construction. But before you say you have the AHA moment that you think I chose Leica because of the details of it's construction and quality, that's not the reason why. Previously, I never really researched the history of Leica. It was after spending hours on some Leica fan site, reading about why people love Leica, and why the company is so great, that I found my 180 degree moment. I don't know how many fans of Leica actually appreciate it, or value the company, but the number one thing that made me really admire this system was the company's level of tolerance. In my research, I hadn't realized just how much this company was built on that principal. It doesn't say that Leica users are tolerant, but after reading the history of the company and the timeline that went along with it, I found a kind of tolerance that made me realize what a fabulous company this was. I decided it was not only time to try using a Leica system full time, but maybe it was time to look at all my own prejudices with film, Leica, and to a lesser degree, the community behind analog photography. I still have my opinions, but more importantly to me, I'm proud to carry this system not to show my values around my neck, and frankly many people would not ever see it that way, but that this is to me a personal choice that I would use something practical, patient, and without prejudice. For whatever other reasons why people pickup this overpriced box that hold film, will be a sentiment that I will still likely believe in. I have no intention at this time to pick up a digital version of it, but in the meantime, when I go out to shoot something for fun, It will likely be the first camera I grab. Regardless of what this may mean, I still believe the best camera for you, should be an extension of your values. For me my values are of tolerance, and this camera not only displays it for me, but helps me capture it.